Paessler has developed specific sensors included in PRTG Network Monitor to monitor NetApp devices. One sensor within PRTG is one aspect that you monitor on a device, for example a specific URL, the traffic of a network connection, a port of a switch or the CPU load on a machine. PRTG Network Monitor includes more than 200 sensor types for all common network services. Hospitals often underestimate the importance of their underlying network and infrastructure when deploying connected health devices and services, according to Andrew Timms, APAC region sales director for infrastructure monitoring provider, Paessler AG. “A lot of hospitals are placing a lot of focus on smart systems, but they’re not paying any attention to monitoring their networks, because for them, network monitoring is a new concept,” he told IoT Hub. Timms said that network monitoring is arguably more important within a hospital environment than within an enterprise for one simple reason. “We’re not talking about losing money if systems aren’t working; we’re talking about potentially losing lives,” he explained. While network monitoring within a hospital environment is still a relatively new concept, Paessler is already working with hospitals in Australia to demonstrate the benefits of the technology to their operations. Calvary hospitals in South Australia are using Paessler's PRTG network monitoring solution to help in the track of things like temperatures in their operating theatres and blood fridge stock levels, as well as their traditional IT infrastructure. The waste and recycling plants outside the hospitals are monitored as well, such that if they get too full, a ticket will be sent externally to the recycling company to empty them out. “They’ve even incorporated PRTG into their kitchens, so things like dishwashers can be monitored,” Timms added. One of the more valuable benefits for a hospital that uses a network monitoring solution is that infrastructure that may have previously been neglected can now be given an active level of care to ensure that it’s running smoothly. It can also uncover a lot of previously unknown issues that require attention. Timms said that hospital staff – like employees in enterprises – can get used to systems going wrong and failing. “However, once you start installing something like PRTG and realising why things are failing and making proactive changes to get things to run smoothly, it makes a huge difference to the system and gives hospital staff the confidence that things are functioning properly,” he added. Turning a hospital into a smart facility requires endorsement from all levels of management, and a high degree of consultation and collaboration to ensure a successful transition. While it’s easy for infrastructure administrators to see the value in a network monitoring system in a hospital, the actual process of adoption and implementation of such a system as part of a smart health initiative is expedited when top-level management can see the benefits themselves. “To go outside of standard networking and go into smart devices, applications and other things – which fall outside of the remit of normal infrastructure management – requires hospital directors and other parties that are planning for a smart hospital transition to start thinking about monitoring themselves,” Timms said. To ensure that connected medical technology can improve the operations of a health facility – and by extension ensure a better level of service for its patients – requires a unified focus between the medical staff and their IT departments. “Medical devices tend not be considered in the same way as standard network equipment. We’re bringing in smart equipment into operating theatres, which are handled by operating theatre technicians, doctors, nurses, and so on, and this equipment is essentially software and hardware, these days,” Timms explained. There are cities that are deploying connected technologies in isolated areas such as waste management or street lighting, but according to one senior industry executive, a truly smart city brings these component parts together, with data and insights being shared across all departments. “There are a lot of systems out there, a lot of sensors, and a lot of equipment that’s capable of providing the information to be used in a smart city program,” said Andrew Timms, Paessler AG sales director for the APAC region. “However, they’re not currently being utilised because that information is not currently being connected. They haven’t connected the pieces together, and they’re not pulling all the information from those devices. PRTG is Paessler AG’s infrastructure monitoring platform, and can overlay information from a given device with data from other sources, providing a more complete picture of a smart city’s operations. “The platform allows city councils to put together the pieces they’ve already got with minimal spend,” Timms added. An infrastructure monitoring platform like PRTG is critical to ensure the stability of a smart city network, more so than in a traditional corporate network, according to Timms. A traditional corporate network would typically consist of desktops, laptops, printers, and perhaps thin terminals towards the edge of the network, and classic server or cloud infrastructure in the back-end. Such a setup is relatively easy to manage from a capacity planning perspective, as resource usage can be reliably estimated for various scenarios. However, a smart city could consist of a wide variety of hardware devices, each with its own data payload and network usage intervals. These systems also tend to be connected to critical physical infrastructure, and will be subject to wider variations in operating conditions and usage scenarios. Furthermore, the segregation of city departments means that connected systems can often be implemented and operated independent of a central control system or with a lack of visibility of these systems across departments. To bring these systems together could potentially shine a light on previously unknown network devices, much like the ‘shadow IT’ that corporate network administrators have to contend with. This uncertainty can inevitably lead to insufficient network provisioning when these disparate systems are eventually interconnected, according to Timms. “To begin to start looking at these systems, councils can put a platform in place to look at their connected systems and their underlying infrastructure as well,” he explained. “In any large-scale project, you’ve got to have a good understanding of what’s happening now, and then you need to move into what could potentially be the future. One of the key advantages of the PRTG platform is that it contains automatic agents, or ‘remote probes’ to sniff out connected infrastructure at the time of platform installation, and then at regular intervals throughout day-to-day operation, according to Timms. This not only simplifies the rollout of its monitoring capabilities, but also ensures that any new infrastructure added is incorporated into the wider system in a timely manner. This would be especially useful in smart city developments, where device rollouts occur at different times due to staggered project completion dates. “PRTG uses these automatic agents to go out, scan the network, poll the devices, and call the information back in to the central repository,” Timms said. “Then it’s a matter of categorising the detected devices by type, location, or whatever criteria the user chooses. Implementasi Smart City di Indonesia tergolong unik. Berbagai pendekatan dilakukan untuk mengimplementasikan konsep SMART CITY INDONESIA. Apa saja ragam implementasi smart city di kota-kota Indonesia ? Ayo tunggu apa lagi ? Segera ikuti perkembangan implementasi dan solusi terkait Smart City di Indonesia, dengan bergabung ke ASOSIASI SISTEM INTEGRATOR DAN SEKURITI INDONESIA (ASISINDO) dan ASOSIASI PENGUSAHA TEKNOLOGI INFORMASI DAN KOMUNIKASI NASIONAL (APTIKNAS) yang akan fokus ke smart city. Dual WANThe Vigor2912Fn designed for the small office applications helps your businesses achieve the goals of business growth, innovation and responsiveness. This ideal VPN/firewall router replaces the simple Wi-Fi router offered by ISPs. The dual WAN load-balance and redundancy ensures your office to stay connected. The network security is realized by robust firewall and Web Content Filtering. All your subscribed bandwidth can be smoothly allocated to the essential applications (e.g. VoIP) by the advanced QoS. The VPN tunnels cover the needs of the inter-office / remote access via multiple protocols. The secure Wi-Fi network enables the office environment ready for the trend of BYOD (Bring Your Own Device) to enhance the productivity. At last but not least, the Vigor2912Fn supports the IPv6 for the seamless migration. 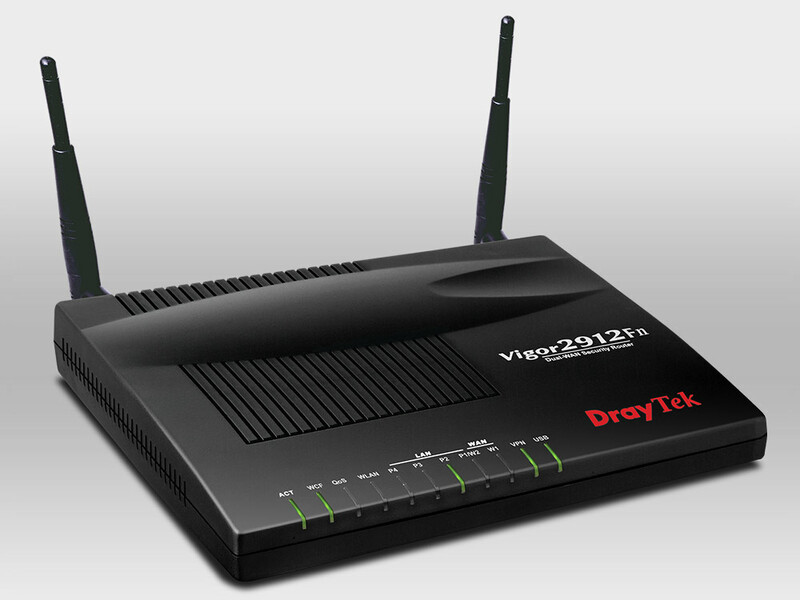 Vigor2925 Series is the IPv6 ready dual WAN broadband security firewall router. It ensures the business continuity for today and the future IPv6 network. Its two gigabit Ethernet WAN port can accept various high-speed Ethernet-based WAN links via FTTx/xDSL/Cable. The 2 USB ports are for 3G/4G LTE mobile broadband access. With the multi-WAN accesses, Vigor2925 routers support bandwidth management functions such as failover and load-balancing, making them ideal solutions for reliable and flexible broadband connectivity for the small business office. You can combine the bandwidth of the Dual WAN to speed up the transmission through the network. The Gigabit WAN port is ideal for connection to fast Internet feed such as Fiber and VDSL2. The 10/100 Base-Tx port can act as back up or primary WAN, which is suitable for sharing bandwidth of xDSL or cable modem. In case of your primary ISP or DSL line suffering temporary outage, WAN-backup offers you redundancy to let the secondary Internet access temporarily route Internet traffic. All traffic will be switched back to your normal communication port as services are resumed.